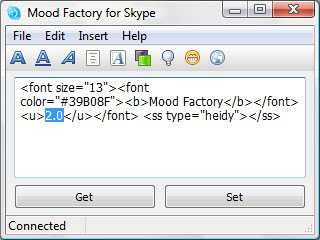 Mood Factory is a small tool that allows you tocreate impressive mood messages for your Skype profile. # Insert link feature: show hyperlink with alternative text. # Get button: retrieve already written mood message. # Select text you want to edit and press formating button - text will be automatically inserted into code. # Automatic reconnection: program will automatically connect to Skype, when connection will be possible.